Our Father's music program strives to provide quality music using a variety of styles. We hope you will find the music touches your heart while giving glory to God. At Our Father's, everyone has the opportunity to share their musical gifts through one or more of our music activities which are listed below. We have several musical groups that lead us in our shared ministry of worshiping and praising God. If you enjoy music and want to get involved, you are welcome to participate in any number of opportunities for fellowship and service! Four-part music is sung, with varying levels of challenge and a mix of traditional and modern pieces. They are accompanied with a mix of piano, organ, electric piano, harp, brass, violin and Hand Bells. Service Participation: Generally one Sunday per month, additional participation during the Lenten and Easter Season and Christmas services including a Christmas Cantata. 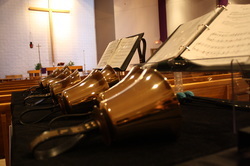 Each choir member is responsible for two to four bells, so each person's commitment to consistent participation is critical. If you've never rung bells before, you can learn! 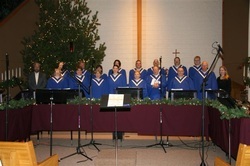 Music is an important part of worship at Our Father's Lutheran Church. Along with the opportunity for participation comes the obligation for commitment. Of course, you can always give choir a try before committing!